How do I create my fund? Creating a fund is super straightforward – once you have your account set up by our team, click here to get started and follow the instructions as you go. How many funds can I create? As many as you want. There’s no limit. Can projects be matched to more than one of my funds? Yes, as long as they meet the matching criteria – projects can be matched to any available funds. Can I add bespoke questions? Yes you can. If you haven’t already spotted the functionality as you navigate the different sections of our Question Builder tool then you have an opportunity to add it in the custom question section at the end. Can I edit my fund? Once your fund is live you’re not able to edit custom questions (as it will affect live pitches) but you can remove or add a new question at any time. Matching criteria include project category (you can choose as many as you want, creators can only select up to two), high level impact area (what the projects are hoping to impact – you can choose as many as you want, as can creators), location (add as many different locations as you want from the drop down list of regions or countries or by drawing your geographical area) as well as the types of project creators you’re looking to support whether individuals or specific types of organisations (or all of the above). Set your project criteria and project creators who match them will be encouraged to apply to your fund. How do I pledge to projects? Pledging to projects is easy, once you accept a pitch, go directly to the project page and select ‘Back this project’. You will then be directed to a payment screen offering you the project creator’s preferred platforms to accept payment. How can I get project creators to sign an agreement or contract? You can upload your terms and conditions when you set up your grant – this can be anything from a few bullet points to full legal guidelines. When you pledge to projects you can choose whether you require the project to accept their terms first. This offers greater transparency to project creators as any terms and conditions are displayed to them upfront when they’re offered a pledge and to receive the pledge project creators need to click ‘accept’ (or decline!). What’s more, both you and the project creators can view and download a PDF copy of the agreement at any time. Where can I see who has applied to my fund? When you log in, head over to your Funds dashboard (see below). You can see under each of your funds how many applications/pitches have been received. When you click on the funds themselves, you’ll be able to view any of the applications in detail under the ‘Pitches’ tab. Who can create a hive? Anyone can create a hive, whether you’re a community organisation, council, corporate, philanthropist, charity, network, property developer, or just someone with a great idea (some of those that already have are below). Hives are great for people who want to make their local area better or to support projects as part of a themed initiative. Creating a hive is quick and fun. Get in touch – we’d be delighted to help you get started. Creating a hive is quick and fun – anyone can set one up, whether you’re a community organisation, council, corporate, philanthropist, charity, network, property developer, or just someone with a great idea. It costs £4,000 +VAT a year (£334 per month) to have your own hive, which includes the licence to use our software, free functionality upgrades, project support, and unlimited client support and advice throughout the year. If you are interested in creating your own hive please contact info@spacehive.com for more details. It takes minutes to set up an account. One of our team will help you get started, advising you on how to build your hive and make it a success and, once you’re up and running, we’ll provide all the technical and user support your community needs. We are constantly working to make hives more useful and powerful – and you’ll benefit from all the improvements we make at no extra cost. Managing a hive can be very low maintenance – in fact you don’t have to do anything at all because our automatic updates tools keeps your community in the loop. If you don’t have the resources to support a paid ‘hive manager’ consider putting together a team of “champions” that can share the burden in their spare time on a voluntary basis. They can all share the login details for your various accounts, publishing posts on Facebook, tweeting and commenting on your projects whenever they have time. Hives become powerful when lots of people and organisations follow them and proactively contribute to the success of projects. To make an impact you’ll want to nurture an engaged community of supporters around your hive that helps your projects as much as possible. Supporters can contribute in a spontaneous or structured way (for example by match-funding projects, volunteering support, or giving them media exposure). The more you develop the community of supporters around your hive, the more powerful it will become. You can explore existing hives here. If you want to create your own get in touch. Editing your hive is easy. To make edits to your hive title, banner, description or URL you will need to go to your Account Home, click on My Hives and select the hive you wish to edit. To make edits to the subsections within your hive simply log into your hive manager account and go to your hive page. From there you can make changes directly into the subsections using ‘Markdown’, by clicking directly onto the content. Please see our Markdown guide below for more information. This is a guide for using Markdown to create and edit content in your hive pages. Markdown lets you apply basic formatting to your hive pages by adding punctuation characters, such as *emphasis* and **importance**. Markdown is really easy to use so don’t worry if you’re not used to coding, just follow this simple guide. It’s really easy to add a video in Markdown, but only videos uploaded onto Youtube can be added. To upload a video you simply need to go to your video on Youtube, click on the “share” button at the bottom of your video, then click “embed” and copy and paste the link provided. See an example below. If you want to type a formatting character and have Markdown treat it as text and not formatting, type a backslash first \. This means \* gives *, \_ gives _ etc. What happens at an ideas workshop? What happens at a live crowdfunding event? 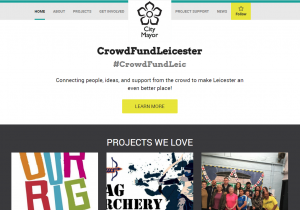 What does a crowdfunding workshop involve?